Here are frequently asked questions about RemotePC, its features and remote access. Does RemotePC work behind firewalls and proxy servers? How can I restrict unauthorized access to my computer? What is Personal Key? How does it help in securing remote access? How are data transfers secured in RemotePC? Is the data encrypted during file transfer? Will I be asked to provide confidential information? How do I set up two-step verification for my RemotePC account? How can I authorize my device as a Trusted Device? 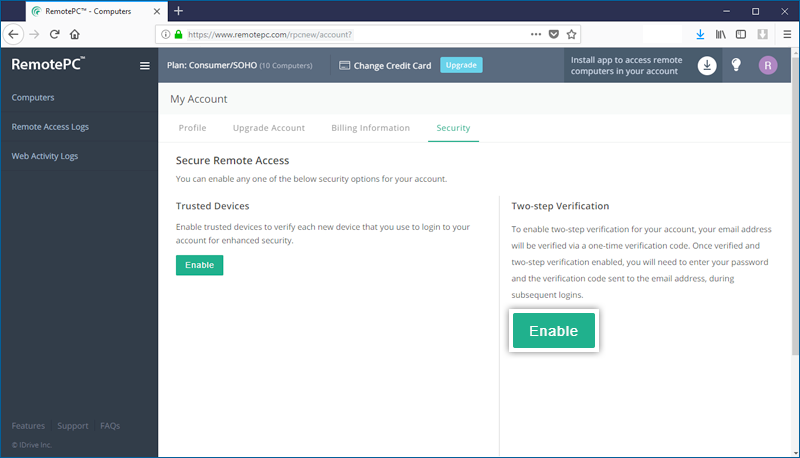 Can I enable both trusted devices and two-step verification for my account? Can I enable two-step verification or trusted devices for users? Yes, RemotePC offers secure and optimized solution for accessing remote computers. RemotePC uses TLS v 1.2/AES-256 encryption for transferring user authentication data between remote computer and local computer. Personal Key, a unique password set for each computer, acts as an extra layer of protection. Yes, RemotePC allows you to share your computer over any kind of Internet/LAN connection and even any firewall/proxy server. 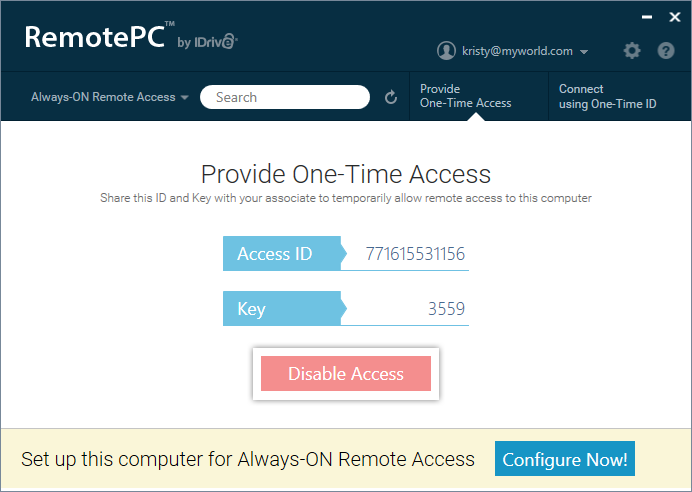 Your computer can only be accessed if you share your RemotePC Access ID and the associated random key with another person. Without knowing the Access ID and key, it is not possible to access your computer. Do not share these credentials with a person you do not trust. To completely prevent any access, disable the Instant Access option by clicking 'Disable Instant Access'. Personal Key acts as a secondary password to access each computer. It is a password set by you and acts as your computer's unique access code. It is stored only on your computer and not on the RemotePC servers. Whenever you try to access any remote computer, you will be prompted to enter the personal key. RemotePC uses TLS v 1.2/AES-256 encryption for securing data transfers between local and remote computers during remote session. Yes. RemotePC uses TLS v 1.2/AES-256 encryption on data transmission during remote access. We will never call you asking for login information, requesting payment or any other such information. If you receive a call of this nature, it is probably a phishing attempt. During such a scenario, do not share any information, and immediately contact us at support@remotepc.com for quick assistance. The two-step verification process enhances the security of your account and prevents access by unauthorized parties. 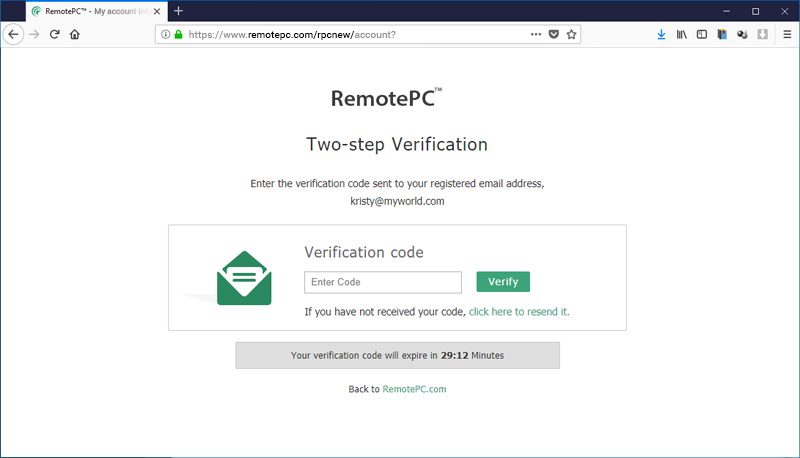 Once two-step verification is enabled, in addition to your password, you will need to enter a verification code sent to your registered email address, while logging in to RemotePC. Log in to RemotePC via web browser and click your username at the top-right of the screen. Select 'My Account' and navigate to the 'Security' tab. In the 'Two-step Verification' section, click 'Enable'. Enter the verification code sent to your registered email address and click 'Verify & Enable'. On the login screen, enter your username and password and click 'Login'. You will be prompted to enter a verification code sent to your email address. Enter the code and click 'Verify'. Trusted devices provide an additional level of security for your RemotePC account. 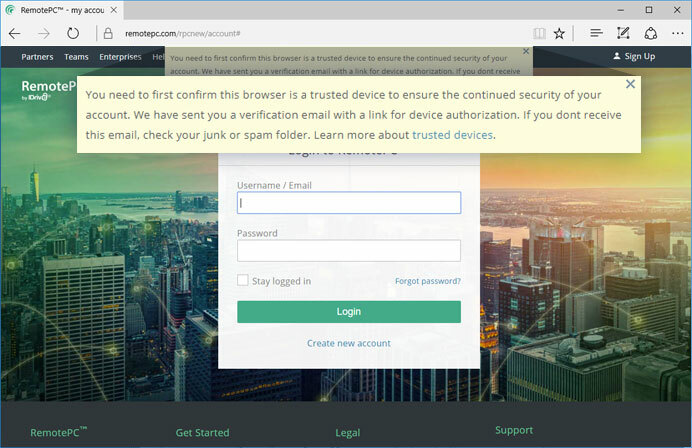 Each time you login to your account from a new device, you are required to authorize it as a Trusted Device. You can thus prevent any unwanted access to your account. A device authorization email will be sent to your registered email address. Click the 'Add to trusted devices' button in this email to add the device to the Trusted Devices list. A confirmation message will appear, informing the same. You can view the list of all your linked devices in the 'Security' tab of your 'My Account' section. In operation, two-factor verification and trusted devices security features are mutually exclusive. Therefore, at a given time, you can enable either two-step verification or trusted devices and not both. 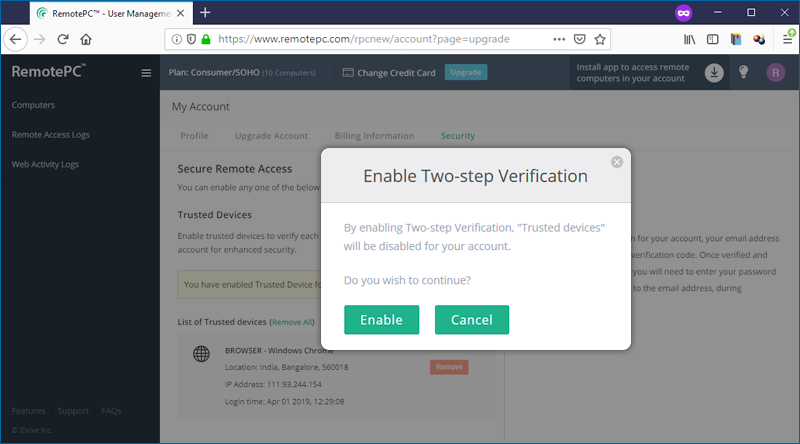 If you attempt to enable two-step verification while trusted devices is enabled, a pop-up disclaimer will inform you that trusted devices will be automatically disabled and vice versa. Yes, you can enable two-step verification or trusted devices for new and existing users. 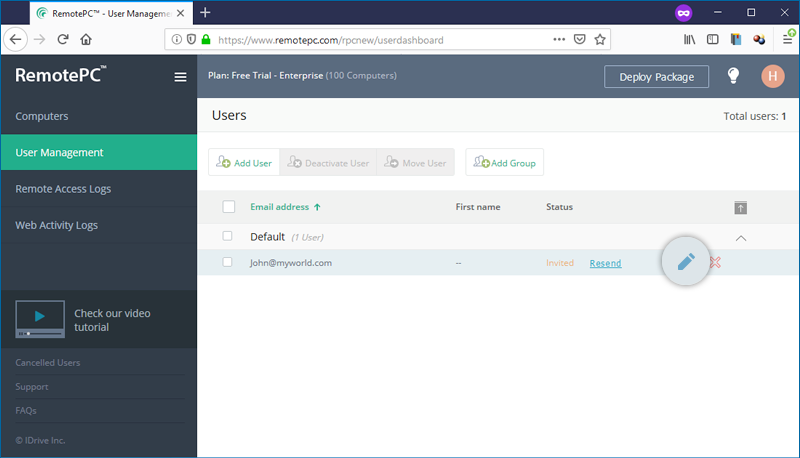 While adding a new user, you can select either the 'Enable trusted devices' or 'Enable two-step verification' checkbox in the 'Add User' screen. 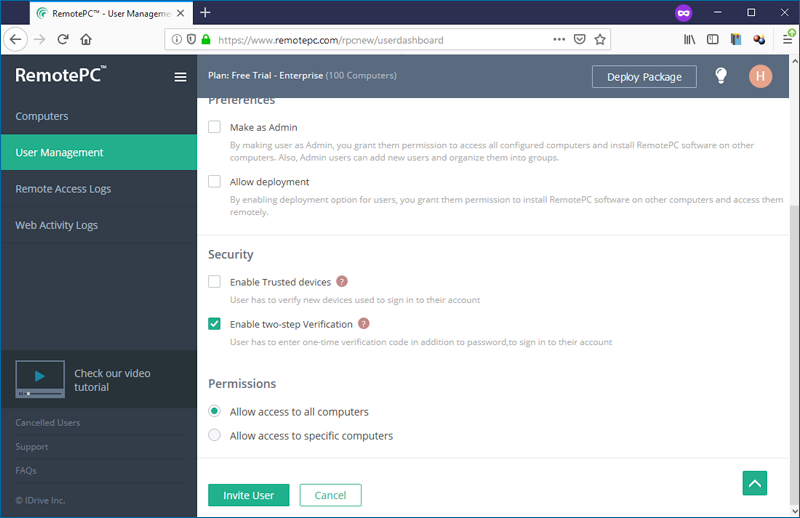 You can open the 'Edit User' screen by clicking displayed against an existing user, and then select the 'Enable trusted devices' or 'Enable two-step verification' checkbox. Once you have enabled two-step verification for your users, on login they will be asked to verify their email address via OTP. After the verification process is complete, they will need to enter a verification code sent to their registered email address during subsequent logins. 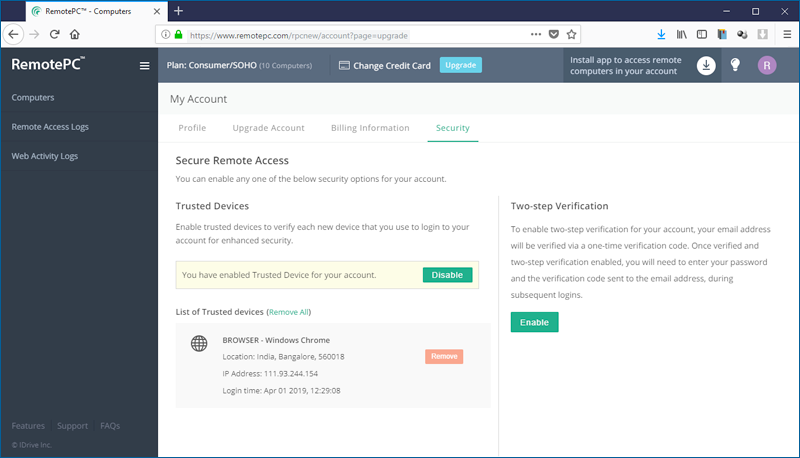 Once you have enabled trusted devices for your users, the users will be prompted to authorize every new device at login. They will need to click the 'Add to trusted devices' button in the device authorization mailer they receive.